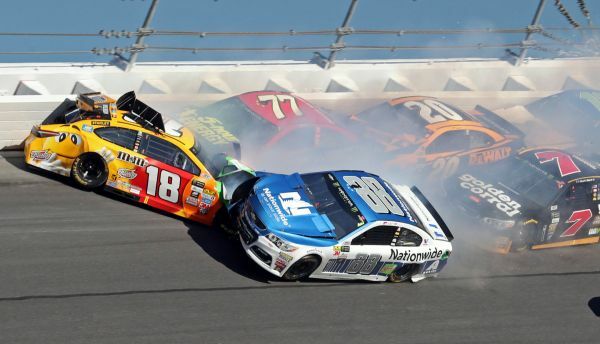 Sunday’s 59th running of the Daytona 500 was a wildly chaotic affair, with eight caution flags and numerous, multi-car pileups that left 35 of the 40 starters with at least some degree of damage at the finish. In the aftermath of similar carnage in the previous days’ Camping World Truck and XFINITY Series events, many railbirds were tempted to point a premature finger of blame at NASCAR’s new, multi-stage format. A check of the facts, however, points to another culprit; the drivers themselves. The race started well, with exciting, three-wide racing through the first 250 miles. As the halfway flags flew, however, the “Great American Race” turned into a county fair demolition derby, with five major crashes in a 45-lap span. On Lap 105, Kyle Busch’s bid for Victory Lane ended when he blew a tire and slammed the wall in Turns 3-4, sweeping up perennial Daytona favorite Dale Earnhardt Jr., Matt Kenseth, rookies Erik Jones and Ty Dillon and Elliott Sadler. Busch, Earnhardt and Kenseth were eliminated from competition. On Lap 128, Jamie McMurray, Trevor Bayne and seven-time series champion Jimmie Johnson tangled, triggering a massive, 16-car mashup that eliminated Johnson, Kevin Harvick and Danica Patrick. 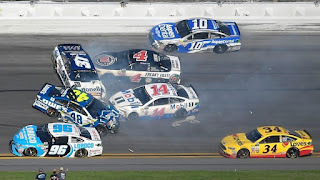 On Lap 137, Ricky Stenhouse, Jr., Trevor Bayne, Ryan Blaney, Sadler and Jeffrey Earnhardt drivers crashed on the backstretch, drawing yet another yellow flag and ending Stenhouse’s day. On Lap 143, Brad Keselowski, Landon Cassill, Chase Elliott, Ryan Newman, DJ Kennington, Brendan Gaughan, Daniel Suarez, McMurray, Hamlin, Jeffrey Earnhardt and Ty Dillon were at it again on the backstretch, ending the afternoon for Earnhardt, Keselowski, McMurray, Suarez and Dillon. And finally, on Lap 151, Gaughan and Joey Gase crashed on the backstretch, with Elliott once again getting a piece of the action. That’s a whole lot of wrecking in a short period of time. 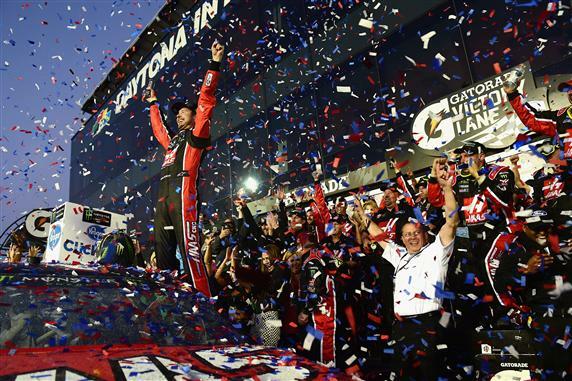 None of it, however, can reasonably be blamed on NASCAR’s new, stage-oriented format. Sunday’s First Stage ended on Lap 60, 28 laps after the race’s first yellow flag. Stage Two restarted without incident and ran caution-free for another 44 laps. Stage Two concluded on Lap 120 -- again without incident – with Stage Three beginning cleanly and running seven laps – nearly 20 miles -- before the calamity began. The final 49 circuits of the event also ran caution-free, despite some spirited, three-wide racing that produced a first-time winner in Kurt Busch, but only after youthful contenders Elliott and Kyle Larson fell out contention after sputtering out of fuel on the final lap. Did too many cars get wrecked Sunday at Daytona? You bet. Is NASCAR’s fledgling format to blame? Absolutely not. That often happens in restrictor plate racing, regardless of format. The World Center of Racing has always been unpredictable, and Sunday’s race was hardly the first season opener to be afflicted by an outbreak of Yellow Fever. It has happened for decades, and it will happen again. There will be plenty of time in coming weeks to assess NASCAR’s new, stage-based format. The sport’s annual Western Swing – with events at Atlanta, Las Vegas, Phoenix and Auto Club Speedways – should provide a calmer, less-volatile yardstick with which to measure. What explains the multiple crashes in all 3 events? Cars (and Ttrucks) racing inches apart at 180-195 mph. Lol moody. Not to mention less down force. Yup I agree across the top 3 national divisions rookie and veterans made slight mistakes that caused big wrecks. Harvick was right, McMurray caused the two largest wrecks and was driving with his head up his rear. Gordon and Waltrip up in the booth both blamed McMurray for trying to go 4 wide so early in the race and Jimmie said McMurray had JJ's back tires jacked off the ground all the way down the straght before turning him in the corner. I guess MacMurray was the only person alive who hadn't heard that bump drafting wouldn't work because the bumpers don't match up. It was good to see him driven straight into a wall, it really was. So you interviewed Stenhouse to see if the new stages affected the racing, why ? Stenhouse hasn't won a single race in over 4 years racing in Cup, not one, so why ask him, ask a real driver. Not sure why he still has a ride at all. I think J-Mac accounted for crashing over half the cars in the field in two separate incidents 15 laps apart. He was easily the biggest factor in all the carnage Sunday. Three stages are cool but no intermission keep it a 500 miles race. Just every stage is scored at the appropriate time. I thought it was a great race...and reminded me at times of the "old days" and "the big one". BUt it was racing, loved it! And as much as I am a McMurray fan, I had to cringe a few times, questioning his bold, and often disastrous moves that took out good cars. No complaints from this fan here about the format, bring on the rest of the 2017 season! I cannot help but think the "stages" are just enforced commercial breaks. I didn't like the clock in truck, and this was just as dumb. I also really don't like it when a car that probably could keep racing and competing is sidelined by the new repair rules. That also just seems like a cost savings so teams can fire some more people. Ultimately the drivers themselves have to be held accountable for these crashes. There weren't any examples of air-off-the-spoiler-type crashes which objectively would not be the fault of drivers. The wrecks consistently happened because someone either blocked when he should have held his line - it seemed a lot less prevalent in the Powershares 300 and Nextera 250, due to the greater effectiveness of push-drafting within NASCAR's rule box - or bulled into a hole that wasn't there. What the segments did do was incentivize going for the lead, and it showed in terrific racing in all three major races during Speedweeks - what stunned me reading the stat sheet when it was all through was that official lead changes (a combined 74 for Friday through Sunday races) seemed surprisingly low given the sustained battle for first throughout the weekend. That the bonus points for these segments has made going for the lead more important showed in that drivers like Johnny Sauter in the Trucks and Kevin Harvick in Cup outpointed all but a few drivers in their respective races (Sauter outpointed the entire field other than race winner Kaz Grala) because they won segments and led more laps than anyone else - so now all three series have eminently more reason to go for the lead. And that ultimately is what racing is about - so while I do agree it can be tweaked to be less gimmicky (I agree with those who advocate keeping the race going after each segment and adding the bonus points without throwing the yellow) the concept of the segments so far is working and working spectacularly well. Best racing ever. Everybody up on the wheel trying to goto the front. That's racing folks! The wrecks are a result of that desire to win. Give it time. Drivers will figure it out that you can't win with a wrecked car sitting in the garage. Nice job Nascar innovating excitement into a dying sport.